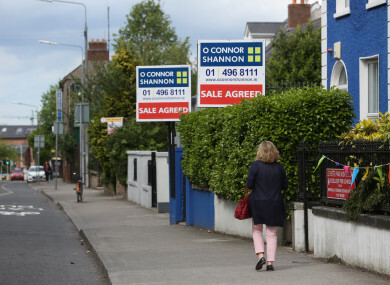 IRISH PROPERTY PRICES rose by more than 12% in the last year, however this rate of increase “isn’t sustainable”. That’s according to Davy stockbrokers, which pointed out that the sharp increases aren’t being matched by jumps in people’s wages, which are increasing much more slowly. New statistics released today by the CSO show that residential property prices across Ireland rose by 12.3% in the year to the end of December. This compared to a jump of 9% in the year to the end of 2016. On a monthly basis prices rose by 0.5% between November and December. This compared to a 1% rise between October and November. In 2017 residential property prices increased by 11.6% in Dublin. House prices jumped by 10.8%, while the cost of apartments spiked by nearly 15%. Outside the capital, prices in the rest of the country climbed by more than 13%. The West region showed the greatest price growth, with house prices up 16.4%. Growth was slowest in the south-east region, however even here house price inflation was in the double digits, up by 11%. Overall, house prices nationally are still is 23% lower compared to their peak in 2007 at the height of the boom. Davy stockbrokers noted that monthly inflation fell from 1% to 0.5% in December. However, it said that this is “merely a seasonal effect reflecting the quiet winter period”. “In fact, this is the first time since 2014 that prices have failed to decline in the final month of the year,” a briefing note from the broker said. Looking at the annual increases it said that double-digit house price inflation “is not sustainable over the long term, with wages growing by only 2-3%”. It said that house prices “have been driven upwards by mortgage credit”, noting that the average mortgage loan in the fourth quarter of 2017 was up 8% year-on-year. “Tighter Central Bank lending rules will provide some brake on the process of rising leverage,” it said, but it added that this would likely only be in Dublin. People buying outside the capital tend not to be affected as much by the Central Bank rules, as properties are still cheaper than Dublin. “So outside Dublin, double-digit inflation will probably continue in 2018,” Davy said. Merrion Stockbrokers noted that the government is bringing in several measures in an effort to tackle the housing crisis. However, it added: “As we wait for the measures to come through, prices will continue to rise. Email “Irish house prices have soared again and people's wages can't keep up”. Feedback on “Irish house prices have soared again and people's wages can't keep up”.